SEPTEMBER 30, 2013 — EVANSTON, ILL. — "Mom, I want to be like him one day," Elisabeth Sladek (C16) said to her mother when she saw the Northwestern University drum major run across the field. That was when she was 9 years old, Sladek told the Northwest Herold's Joe Bustos in an article appearing today. The paper covers Sladek's home town of Crystal Lake, Ill.
Bustos profiled Sladek, who is one of three drum majors this season for the Northwestern University "Wildcat" Marching Band, in the paper's "On the Record" feature. 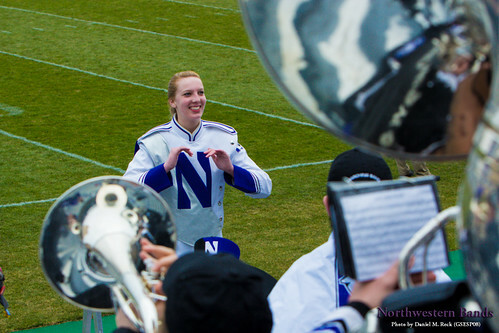 "A 2012 Prarie Ridge High School graduate, where she served as a drum major for two years, Sladek is a sophomore at Northwestern," reports Bustos. In the article, Sladek discusses the steep time commitment of performing with the Wildcat Band, but says "it's totally worth it." She also says her first time leading the band at Ryan Field was "completely nerve-racking, but also, it's an indescribable feeling." Bustos also shares Sladek's remarks about how fans from Crystal Lake responded when Voice of the Band Pete Friedmann announced "Elisabeth Sladek from Crystal Lake, Ill." at High School Band Day on Sept. 7. "I heard them go nuts," she told the Northwest Herold. "That was a big confidence boost." Sladek also discussed her style as a Northwestern drum major, her favorite music, and recalled her time performing with the Prarie Ridge band before coming to the university. Read the full article at http://www.nwherald.com/2013/09/17/on-the-record-with-elisabeth-sladek/a7j42ko/.